Jermaine Jackson took the opportunity to pay a tribute to his late brother, Michael, at the Indian International Film Awards in Toronto, Associated Press says. Just a few moments before dedicating the ‘This Is It” song to Michael Jackson, Jermaine said: “This is a special moment in the show because it’s a tribute to my brother. Soon after this, he was joined on the stage by Indian singer and songwriter Sonu Nigam. “This is it” was written by Nigam after the star’s death and was performed by the two artists on stage in honor if the former pop icon. 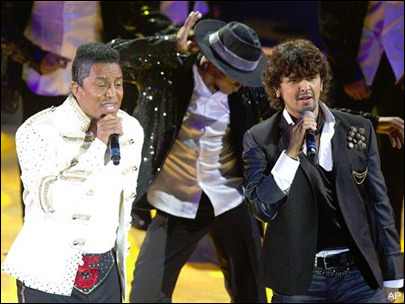 The artistic performance of Jermaine Jackson and Sonu Nigam was a part of IIFA Rocks, which is a Bollywood-inspired concert and fashion show. The concert is at its turn a part of the IIFA festivities, which last three days in a row and culminates with an awards ceremony on Saturday. Jermaine Jackson will honor his younger brother’s life in another way, as well. He has planned to launch a book about the Michael Jackson phenomenon from his perspective. He is not the only Jackson brother to do so. La Toya Jackson already released a book about Michael’s last days. The book is called “Starting Over” and is written in collaboration with Jeffre Phillips. The fans will be able to read about La Toya’s own opinions regarding Michael’s death and not only. Jermaine’s book is scheduled to be released in September. i loved michael jackson for years ago.